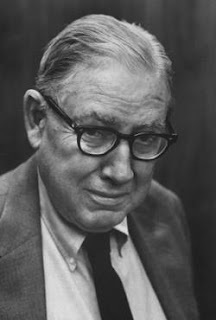 In the midst of preparation for this weekend's ceremonies, it's a good time to revisit Ogden Nash's address to his granddaughter Nell and her classmates at the Miss Porter's School commencement in 1970. One can imagine a great deal of anticipation and speculation among the audience as to what the notable poet would say that May afternoon in CT. Would he quote wisdom from his works? Prepare a new poem for the occasion? Or perhaps talk about how he felt after his own graduation from St. Georges? Nash chose to share something more valuable to the young women off to college in the fall. He advocated for that they employ a sense of humor when addressing the inevitable challenges that lied ahead. He made a vigorous case for humor being "hope's companion in arms." That Nash should find humor therapeutic and important is not surprising. Here was a man who wrote humor reflexively: As gifts to friends or simply to cheer himself up during an ordeal. As when he penned a verse to vent over his car being burglarized in Boston. Nash used light verse to stun, and suspend in a freeze frame, the abrasive elements of the world so he could lampoon and deflate them. Not only has this brief span of ours been threatened by such perils not of our own making such as fire and flood, Tyrannosaurus Rex, the black death, and hurricanes named after chorus girls, but we have been most ingenious in devising means for destroying each other, a habit we haven't yet learned how to kick. So here we are, several billion of us, crowded into our global concentration camp for the duration, How are we to survive? Solemnity is not the answer, any more than witless and irresponsible frivolity is. I think our best chance lies in humor, which in this case means a wry acceptance of our predicament. We don't have to like it but we can at least recognize its ridiculous aspects, one of which is ourselves." Not solemnity nor frivolity, but humor tempered with a wry acceptance of our predicament and a recognition that we are often a ridiculous race: A distinctive message for graduation day.